Language Learning Blog: What's New on our Website? Language learning during our visit to Peru. Welcome to our What's New page. Want to stay current on all the new content we are posting to our site? This section is filled with culture and language learning stories, ideas, and tips. All our new content is displayed here first, as soon as it's added. Come back often to see our new content. Add us to your RSS feed, and you will receive new content directly to your computer as soon as it is posted. The joy of language learning is making new friends. This section includes stories from our language learning experiences around the world. It is our language learning blog. Join us on our journey, and let's have fun together. Click on the orange XML/RSS button to learn how. Everyone of us has a story to tell and we all like to read or listen to stories. Continue reading "Experienced Cuba with International Yoga retreat leader, Erin Fleming"
Continue reading "For the game"
Reviews of top learn Spanish free online sites. We've done the legwork to find sites that are completely free with no strings attached. Save time by choosing sites that don't cost money to learn Spanish. Continue reading "Learn Spanish Free Online"
Living abroad is a great way to learn about the culture and customs of another country. Intercultural communication brings its own share of joys and difficulties. Learn more about culture shock. Continue reading "Culture and Customs: Living abroad can be shocking"
I am learning Spanish language. Today's blog post is part of a language learning moms blog carnival. These posts are written by moms, for moms. Continue reading "Learning Spanish Language: Meals with Mom"
Part two of Walkabout Language Learning's introduction to Spanish language learning resources. Use this page to find links on our site with additional basic Spanish study materials. 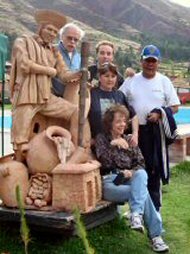 Continue reading "Leslie's Spanish Language Learning Journey"
Learn Spanish using the Walkabout Language Learning method. Introduction to Spanish language learning resources. Continue reading "Both for leisure and for work"
How’s Cuba after 53 years of Fidel? Classic cars, Che billboards, shocking decay . . . but not one AK-47. Travel to Cuba on a pilgrimage with 7 Americans taking medical supplies to Jewish clinics. Continue reading "Travel to Cuba today; join us in our pilgrimage"
Continue reading "Because of my Grandfather"
Do you want to learn a second language? Keep reading to learn how to discover your language learning dreams and make them come true. Continue reading "Walkabout Language Learning: Action Guide"
Continue reading "Santa Lucia -- Celebration of Light"
If shyness is a problem for you, community language learning can be a real challeng. Learn how to master your shyness to accelerate your langauage aquisition. Continue reading "Community Language Learning: How to Overcome Shyness"
Tandem language learning is a great way to practice and improve your new language. Working with a tandem is a language learning technique where you set up a formal or informal arrangement with another person to study languages together. Continue reading "How to get what you need from Tandem Language Learning"
Continue reading "Portable Interpretation System"
A review of Ultimate Language Secrets by Owen Lee. Wow, what a great language learning system! Continue reading "Language Learning System: Ultimate Language Secrets"
Most of us want to do what we do faster, that is especially true with language learning. This page gives you ten language learning tips to help you achieve accelerated language learning. Continue reading "Accelerated Language Learning: 10 Language Learning Tips"
Continue reading "Ilma Lives in London and Loves English "